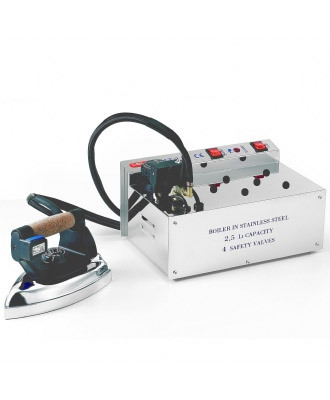 2,5 liter Steam ironing station. Effective 2 liter capacity for about 3 hour ironing. Stainless steel case and boiler with copper heating element. 4 safety systems: pressure switch, probe safety thermostat on the heating element, safety cap with safety valve, low water indicator light. External solenoid valve for steam regulation. Industrial iron FS Line of 1,8 kg with nylon monohose.